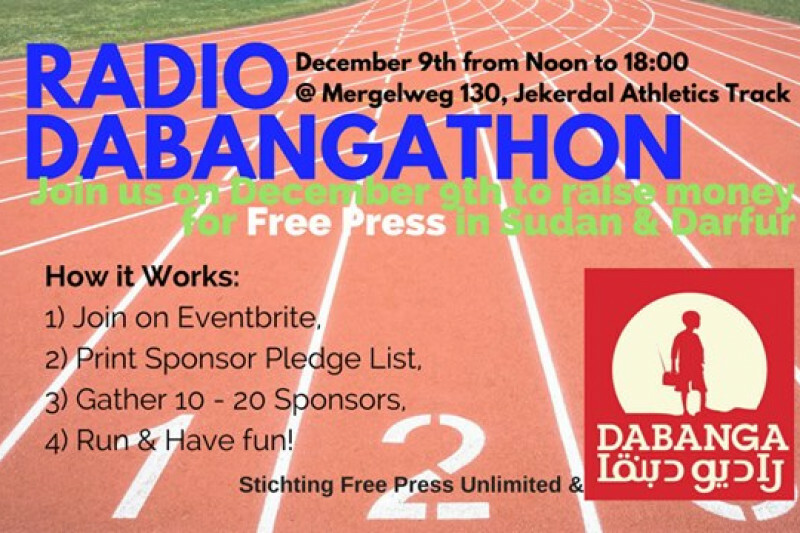 In combination with the run-a-thon, we have also created this crowdfunding page in case there are people who would like to donate but are not able to attend the Radio Dabanga-thon. Tucked amongst the radio stations of the Netherlands rests one which is, at the same time, the one with the greatest number of listeners as well as the one that hardly anyone has heard of. Radio Dabanga is a non profit radio station that produces in Amsterdam and broadcasts to Sudan and the Darfur region with 3 million daily listeners. Where many radio stations simply produce news, music, or talk, Radio Dabanga provides unbiased information to people who depend on accuracy - in fact their lives are directly dependent on it. The condition in Sudan and Darfur, specifically, is precarious to say the least. A complex mess of politics, tribalism, decades of famine, and inflation has led to the deaths of slightly under 500 thousand either by violence, disease, or famine. Between 2.8 million and three million have been displaced, mostly children - concentrated in refugee camps that are conveniently centralized for violent human rights abuses at the hands of any of the several roving militias in the area. The conflict in this region is widely regarded as the worst humanitarian disaster of the new millennium and has become the face of genocide, as well as failure of the international political system, since it began in earnest in 2004. In a world where accuracy of information can mean the difference between life and death, the government, predisposed to tribalism and subjugation of politically powerless groups, controls all information in the country. Radio Dabanga broadcasts daily and delivers the information necessary to make informed decision about one's daily life. If, for example, a child from one town wishes to go to school in the next town over, reports regarding the safety, or mere existence of that town from day to day will be broadcast over shortwave to the homes or tents of the people of the region. Contraband radios are relied upon for receiving the reports, all of which are triangulated for accuracy by the Radio Dabanga Team in Amsterdam, and thus an archaic radio format has, undoubtedly, saved the lives of tens of thousands, potentially hundreds of thousands, over the past ten years. This campaign is fundraising for the production of a high-quality, informative video that will be distributed across many different channels in an effort to increase awareness of, and secure funding for Radio Dabanga. We would be more than thrilled to have you support this cause!